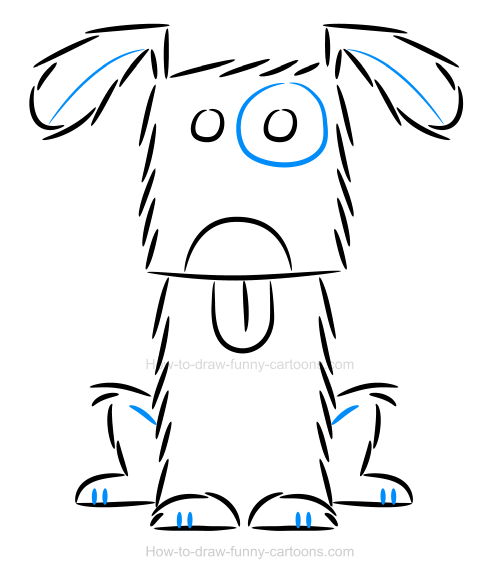 Learn how to create a cute dog illustration using a bunch of irregular lines, simple shapes and plain colors. Drawing using a vector application can be fun, but sometimes results are just too ... perfect! Indeed, it can be amusing to create characters that are made from irregular lines and shapes or filled with colors that are not 100% aligned properly. That's exactly the purpose of this easy online lesson. 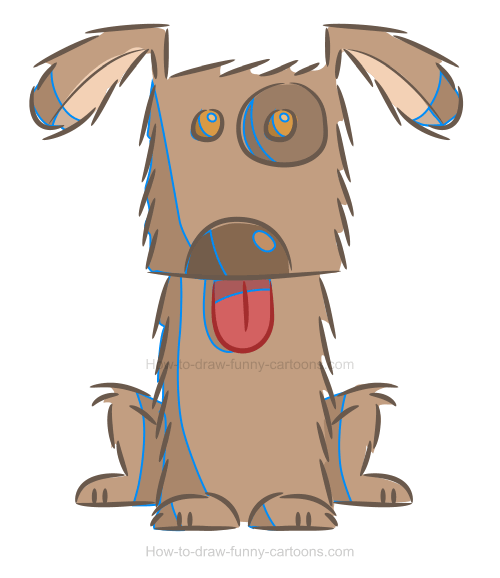 I will show you how to create a cartoon dog that is cute and mostly made from small lines. I also used colors that are not too saturated nor bright. Simplicity rules! Even if our goal is to draw something as if it was made by hand, it's still a good idea to create a template to guide us throughout the whole process. First, sketch a head using a small square. Then, draw two large oval shapes on top of the head to form the ears. 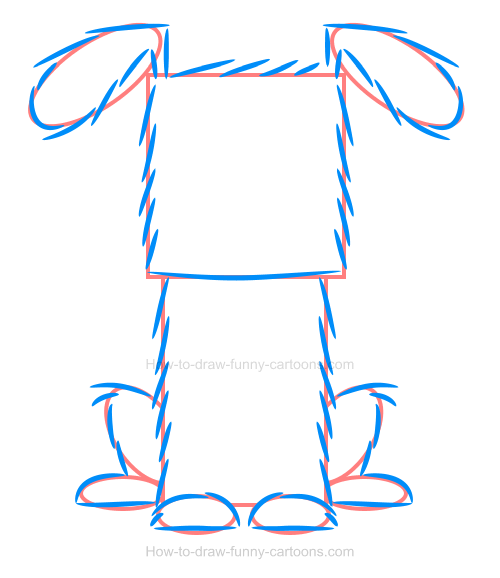 Continue working on this animal by creating a long rectangle to form the body. All legs and feet are made from small oval shapes. Cool! It's now time to use these frames to draw the character. Using only small lines that are pointed on both ends, cover all shapes as depicted below. Only the line below the head is straight and not made from smaller lines. 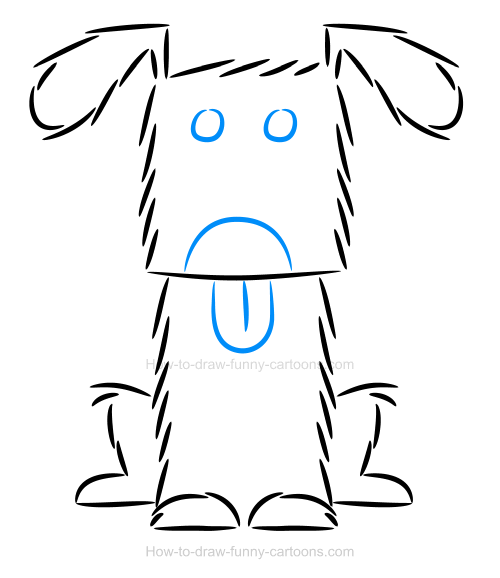 The reason is simple: we need some space to place the nose of the cartoon dog. Inside the head, draw the eyes using small circles made from one single line. You can see on top of each eye the junction of those lines. 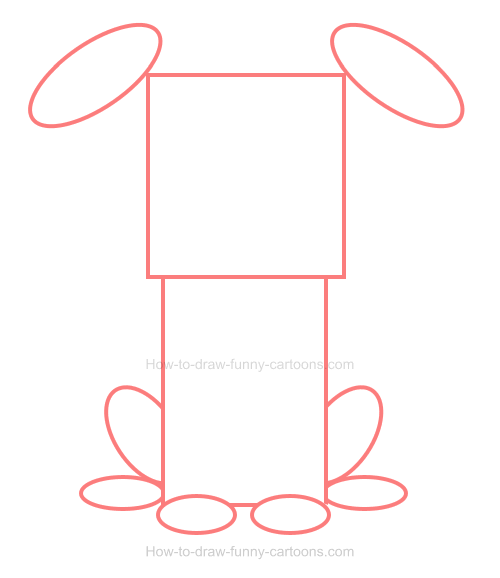 Then, draw a long curved line below the eyes to represent the nose. The tongue of the dog illustration is made from more curved lines. Let's create more details inside this character. First, draw a long curved line inside each ear as shown below. A small patch can also be drawn around the right eye. Then, draw more lines inside all legs to illustrate the claws and the fact that both back legs are bent. Time to add some colors! For this example, I have selected a subtle brown color. Patches inside the ears are brighter while the nose and the patch around the right eye are darker. The eyes are kind of orange while the tongue is red. One thing I like to do is modify all colors found on outlines and strokes. Black lines are fine, but using dark brown lines is even better. For the tongue, simply use a darker version of the red color already found inside this part of the body. One easy tip to create more depth and volume is to add a few shadows on strategic areas. You don't need to use gradient fills to create a cool 3D effect. Plain colors are fine. In this case, we are presuming that the light source is located above the character, mostly on the right of the illustration. You can also add textures to made a dog illustration that is visually more interesting. Once again, no need to draw something complex and filled with details. Just a few short lines all over the body is more than enough to create a nice result. Good work! 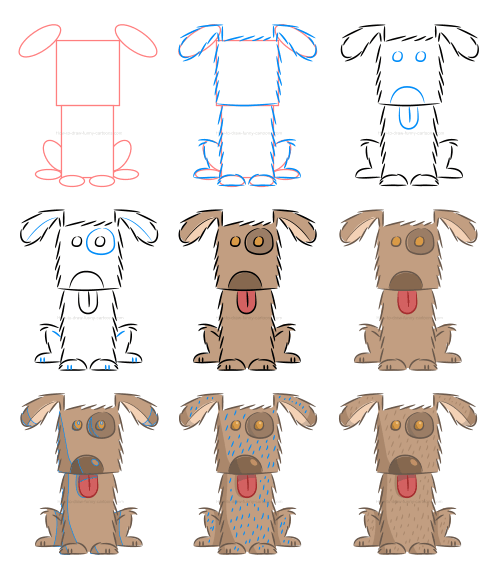 This is our dog illustration once all steps are completed. Pretty cool, don't you think? I really like the simplicity and the fact that this drawing is not perfect. A nice dog illustration in just nine easy steps!